The bike is a Specialized Rockhopper of unknown vintage. The frame is good, even pretty, much of the rest is problematic. When you grab the crank arms there is play. So, does that mean there is a bottom bracket problem? The crankset looks problematic too. Here is a picture of the largest chain ring. Is this shot? If I have to replace the crankset and bottom bracket, how do you determine size and whether they are compatible? I can find cheap cranksets online but they don't say what size bottom bracket they take. I did measure the outside of the bottom bracket shell and it is 73mm.
. . . When you grab the crank arms there is play. . .
between the crank and spindle? between the spindle and BB cartridge? between the cartridge and shell? The teeth look probably OK. It is hard for me to say. How can you tell? Let me describe what I can observe. If I push and pull on one crank arm the entire crank moves a bit. Not up and down but back and forth. Inotherwords, I can see the chain rings and other arm move when I move the left arm. It is like the crank is a smidgen too wide for the bracket. It is possible that there is a bad installation as the bike was originally obtained from an incompetent source. If there is anything else I can try to diagnose this let me know. I agree, localize the play. 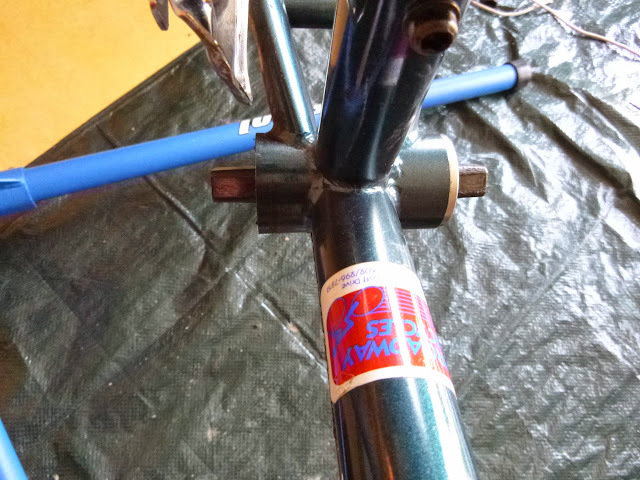 Then, if it really is the bottom bracket, remove the old one and measure the spindle length. It seems to be a square taper spindle so matching the length and bb shell width should define the replacement. I also agree the teeth look ok and that crank has riveted chainrings so replacing them isn't an option anyway. What does need attention is that chain. Edit: I just saw your second posting. So the crank moves laterally only, not radially? I wonder if someone installed a bottom bracket meant for a 68 mm shell width. Simple logic and observation should suffice here - If the arms move in unison the problem is the BB, which means adjustment/overhaul/replacement for the ball and cup style or tightening/replacement for the cartridge style. If only one moves then it is that crank. To help you efficiently we need to know what is "problematic" about the crankset. p.s. Unless it's a severe optical illusion it appears the front derailleur is not in line with the chainwheels. 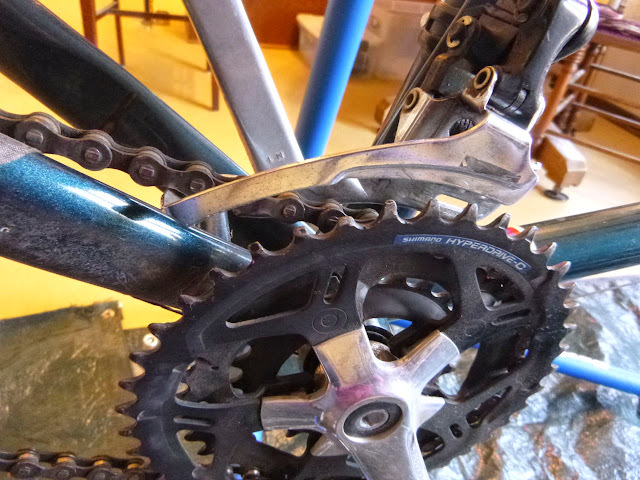 So, because the crank arms move in unison it is the bottom bracket? I do know that the chain needs replacing. The placement of the front derailleur is an optical illusion. So, the one very short tooth on the big ring is a feature? Or a problem but not significant? "So, the one very short tooth on the big ring is a feature? Or a problem but not significant? " It a feature , it is to aid in shifting . Thank you all. So, if I got this right the next step is for me to remove the crankset (which I know how to do), and see what kind of bottom bracket I have. I missed your edit. I am not really sure what you mean by laterally or radially. I can say that if I grab a crank arm no matter what is its orientation to the bb I can move the arm maybe a millimeter or a bit less in relation to the bb shell and the other side also moves. I can pull it up and down or back and forth. So I take it that means both laterally and radially. OK, crankset is off (it was stubborn). Here is what I have, nothing has been removed. Note that one side has a silver "cover" on the bb shell and the other does not. What do I have? I do have the "spliney" tool to remove this in my box of tools spouse gave me. I am just unsure whether this is the right bb for the bike or not. To remove and replace, you'll just need a wrench and a bottom bracket tool (the "spliney tool" you mentioned) like a Park Tool BBT-22 or BBT-32. Actually you first need to make sure both sides are tightened. If they are then yes, indeed you need to replace the cartridge unit. On the right side of the bike tighten the seal unit ( the silver cover ) by turning it to the left ( counter clockwise ) as hard as you can until it can not move . Then do the same to the left side but not as hard ,it made of plastic and can and will break if you use too must stress on it .Tighten it to the right ( clock wise ). Replace the crankarms and see if the problem has gone away . If not then you need to replace the Bottom bracket . It a seal unit and it written on with what size you need to replace it with . Last edited by bikeman715; 04-18-14 at 12:20 PM. Likely there is a size marked on the BB that you'll be able to see, once it's removed. normal for BB shells these days, on Mountain bikes. Oh super yay, ja you betcha! When I put the spliney tool on it I could tighten and loosen it by hand. 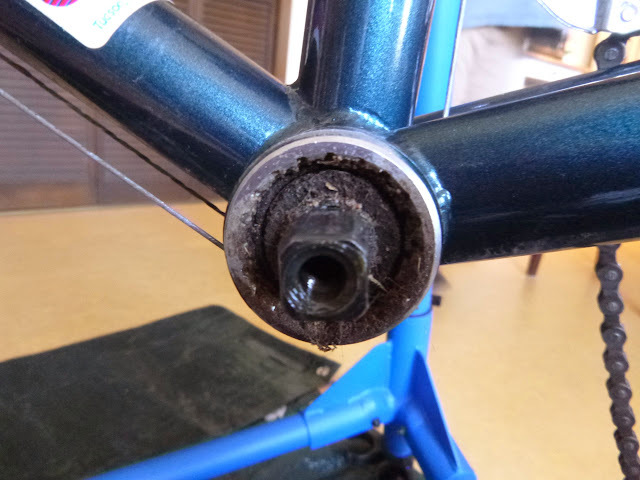 So, I first cleaned out the extensive gunk and the did as you guys instructed and tightened the bottom bracket. I re-installed the cranks. No play at all. Here I was ready to buy a new crankset and new bottom bracket. 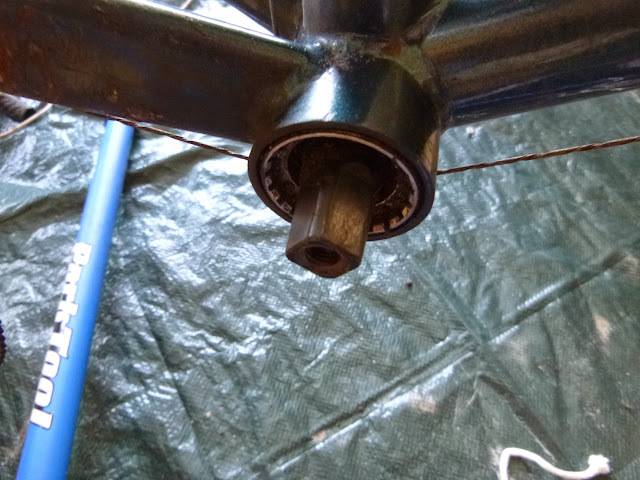 BTW, the bottom bracket doesn't grind or anything and seems to turn just fine. Now to the next junky bike in the pile! I can't thank all of you enough. I learned a lot today. Glad we can help , it what we are here for .